Measurement of nozzles, e.g. fuel injection nozzles in an airplane or car motor, printerheads or jet nozzles. Lenses, also in an array-setup, including asperics. These can be measured over the whole surface of the lens, including sidewalls. Precision components, e.g. watch baseplate. Micro-fludic channels, e.g. in lab-on-a-chip applications and micro fluidic actuators. 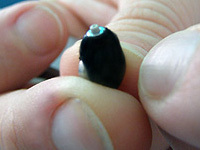 Medical applications, including in-situ devices like smart- pills. Measuring cell properties like stiffness (force- distance curve) and puncture force. Freeform 3D scanning of ultra precision moulds, e.g. for fresnel lenses, with no plastic deformation of the lens surface. spherical tips, thus allowing the measurement of miniaturized parts. In combination with the ultra low probing forces of our 3D probes (both dynamically as statically) the risk of component damage is minimized, even when probing micro-features on soft materials. Ultra precision machining centers can use Gannen probes for the highest precision measurements on their components. For other applications the Heimen series of probes offer an interesting alternative. The Heimen probes combine sub-micrometer precision with an attractive price tag. Collaboration with our customers is a critical factor for the success of Xpress. We strive to work together on product improvement to obtain the best results, for both sides. System integrators working on custom ultra precision metrology equipment, like coordinate measuring machines (CMMs) or machining centers, depend on our high level of support when implementing our products. Also, we can provide engineering support in (precision) machine design and metrology, even if it is not directly related to our products. Xpress probes are designed for high accuracy dimensional measurements on a wide range of components. Whereas the Gannen XP probe is designed for ultimate precision, the Gannen XM and Heimen probes are designed for high precision measurements on miniaturized parts. These include micro holes with a diameter in the region of several tens of micrometers, micro trenches, e.g. for micro-fluidics, freeform surfaces, etc. For ultimate precision the Gannen XP is used to measure precision artifacts, reflective surfaces and lenses (e.g. space telescope) without the risk of plastic deformation. A 3D repeatability (in any direction) of 2 nanometers can be obtained with this system. Combined with its excellent thermal and dynamical properties, the Gannen XP is the most accurate 3D probing system available in the world today. Applications include Micro- and Nano-scale structures (e.g. micro fluidics), metrology and Precision Engineering devices.